There’s a lot more to come from Yellowstone. With the height of tourist season upon us, the demands of rangering have taken all my editing time away. I’m using the long hours of summer on my off days to be out photographing and playing. I look forward to sharing more. The blog will still be showing exclusive photographs that I’ve made on my Nikon. I’ll do my darnedest to continue posting weekly as I’ve done for the past several years. To all my recent followers, thanks for connecting, I love to hear from you. To those who want a more steady dose, I do post daily from my iPhone on Instagram and you’re welcome to follow me there at instagram.com/nomadruss. This is a gorgeous capture Russ. Simply wow. i am heading up for my first visit to yellowstone next month- so excited and hope to catch some great shots. Oops the comment was meant to come from my travel photography blog. Thanks for the recommendation! Mark says they are obviously American bison. Indian buffalo would be on the other side of the road. Love it. It looks like a sequence from a dream. Wow what an image – how did you get it so grainy? This is such a fabulous capture! Wonderful shot. How close were you? Were they aware of your presence? Amazing picture, unbelievable how close you were! well, it’s most important to stay at least 25 yards away from bison, unless you want a good goring. fortunately i was in my truck in a good, safe situation. Ahh I see, it’s easy to forget how careful you must have to be! Yes, they appear so docile, yet get too close and in a moment…. So scary, and very sad too. All the more so, because you’re so close to them. Glad to hear you were safely in your truck. 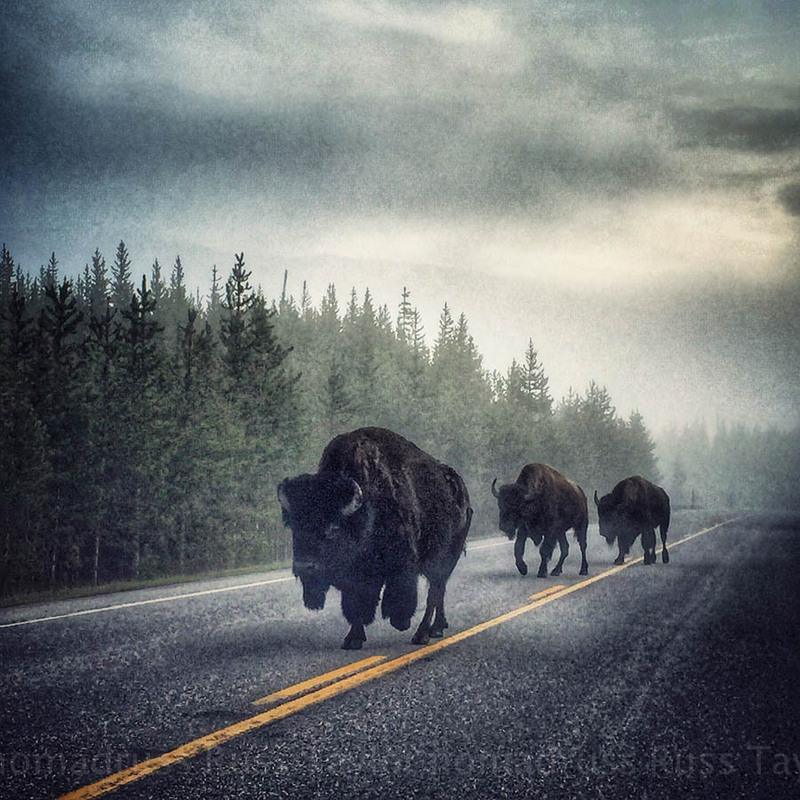 did you ask these bison to travel on hard, durable surfaces (a la leave no trace)? if they could just hug the shoulder it would be great! Fabulous photo! We saw tons of Bison in Custer State Park and they were so majestic. What a gorgeous capture! I hear there are many up that way. I think they’re the most amazing creatures! Yes there are about 1,300 right now in Custer State Park. So terrible that there used to be millions of these beasts and they killed them for their tongues and heads. Do you live in Yellowstone or are you just there shooting? At one we were down to 23 bison left. Unbelievable. A man was caught trying to slaughter them! I’m working for the season as a park ranger at Old Faithful. This is an amazing capture. They look so surreal coming out of the fog. Thanks Briana, I was so happy with how it turned out. I have never been to Yellowstone; for now I will come there through your blog!!! merci pour votre visite et de prendre le temps de commenter! Now that is an awesome photo! So this shot my not be from your Nikon – like the Grand Tetons shot (amazing by the way – especially the colors) but this is such a surprising shot – gotta say awesome! Thanks, this one is from the iPhone. Sometimes I can do with the iPhone what I can’t with the DSLR! I shot this out of my truck’s window and only had a couple of moments to make it work. Appreciate the kind words! I know the feeling just this past week a buck was walking across the road and I went scrambling for my camera. Opportunity lost!